Paneer Pakoda Recipe - Pakodas are prefect tea snacks.This is prepared in less time and Quite easy to prepare it. Different types of pakoda are served in India like potato pakoda, fenugreek (Methi) pakoda, Onion pakoda and (Gobi) cauliflower pakoda etc. Become monsoon, summer or winter, Indians have no reason to enjoy the pakoda that breaks the lips. They prefer well in every season. 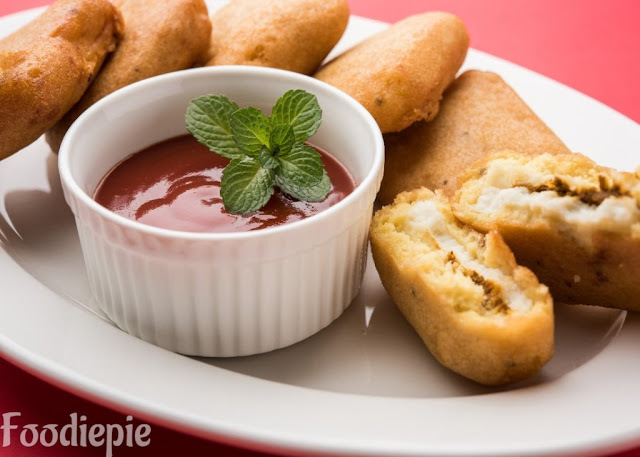 Paneer Pakoda is one of the most favorite and tasty snacks. To make it easy, Pakoda recipe is made with a cheese, gram flour, ginger paste, garlic paste and spices. Serve hot with your choice of ketchup or sauce.Checkout Recipe first. Step 1 : Put the gram flour in a vessel and add red chilies, coriander powder,Ginger-Garlic paste, a table spoon oil and salt, add water and make a thick, smooth batter. Keep aside batter for 30 minutes. Step 2 : Cut the paneer in any shape of your choice.Make two part of every piece then add a little (Chat Masala) spice between each part of cheese and close it and put it in the plate. Step 3 : Heat oil in a deep bottomed pan.Mix batter again before using. Step 4 : Pick a piece of paneer, dip paneer piece in batter and put it in the pan and fry over medium flame until they turns into golden brown. Add only 4/5 Pisces in pan for fry at a time. Step 5 : When Pakodas are fried from one sides Flip and cook the other side. Step 6 : Fry all the Paneer Pakodas in same way. Step 7 : Once all Paneer Pakodas are fried well then transfer to Absorbent paper. Finally : Paneer Pakodas are ready and serve with ketchup's,Green chutney or any choice of your sauce.